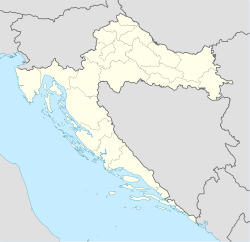 Vrhovine (Serbian Cyrillic: Врховине) is a town and a municipality in Lika-Senj County, Croatia. The municipality is part of Lika. On the territory of Vrhovine municipality, in addition to Croatian which is official in the whole country, Serbian language and Serbian Cyrillic alphabet have been introduced as a second official language. According to 2001 census, Vrhovine had 905 inhabitants of which 55.03% were Serbs and 38.45% were Croats. In the 2011 census, there were 1,381 inhabitants of which 80.23% were Serbs and 12.74% were Croats. The majority of the population of the municipality is elderly. Because of this, the Croatian Ministry of Family Affairs, War Veterans and Intergenerational Solidarity and the United Nations Development Programme secured funding for a centre for the elderly. The centre was opened by Minister Jadranka Kosor in June, 2008. ^ Government of Croatia (October 2013). "Peto izvješće Republike Hrvatske o primjeni Europske povelje o regionalnim ili manjinskim jezicima" (PDF) (in Croatian). Council of Europe. p. 36. Retrieved 30 November 2016. ^ "Minority names in Croatia:Registar Geografskih Imena Nacionalnih Manjina Republike Hrvatske" (PDF). Archived from the original (PDF) on 2013-10-29. Retrieved 2013-03-08. ^ Izvješće o provođenju ustavnog zakona o pravima nacionalnih manjina i o utošku sredstava osiguranih u državnom proračunu Republike Hrvatske za 2008. godinu za potrebe nacionalnih manjina, Zagreb, 2009. Wikimedia Commons has media related to Vrhovine. This Lika-Senj County geography article is a stub. You can help Wikipedia by expanding it. This page was last edited on 20 July 2018, at 08:36 (UTC).